DA Form 260 - also known as the "Request For Publishing - Da Administrative Publications" - is a United States Military form issued by the Department of the Army. The form - often mistakenly referred to as the DD form 260 - was last revised on June 1, 2018. Download an up-to-date fillable PDF version of the DA 260 down below or look it up on the Army Publishing Directorate website. 10. IS PUBLICATION CLASSIFIED? 11. IS TITLE OF PUBLICATION CLASSIFIED? 15a. If yes, enter lead Service/agency and complete blocks 15b through 15d. 15c. Was staffing and legal review requirements completed by other Service/agency? Are there DA administrative publications that are closely related to this DA administrative publication? Will this publication supersede another DA administrative publication(s)? provide the information required in block 24. 25a. REQUIREMENT CONTROL SYMBOL (RCS) REQUIRED BY AR 335-15? complete this section before submission to APD. 29. UPON PUBLISHING, IS THERE ALSO A PRINTING REQUIREMENT FOR THIS DA ADMINISTRATIVE PUBLICATION? COMMANDER (OR DEPUTY), OR DESIGNATED COLONEL/GS-15 INCLUDED? 4a. ACTION OFFICER: Enter the name of the individual serving as the main point of contact for the specific publishing action. management program and is the approving authority for submission of all requests to publish. ACOM commander to the Director, APD. 7. TYPE OF PUBLICATION: Select the type of DA administrative publication being submitted for this publishing action. 8. PUBLICATION NUMBER: Enter the nomenclature for the DA administrative publication for this publishing action. (see AR 25-30 for details on types of publishing actions). 12. TITLE OF PUBLICATION: Enter title of publication for the DA administrative publication being submitted for this publishing action. restrict its distribution (See AR 380-5 for guidance). If yes, select from list. publication is designated FOUO (see AR 380-5 for guidance). administrative publication being submitted for this publishing action. If yes, list the nomenclature and date of each related publication. applicable, state whether only a part of the publication is being superseded. mandatory use Armywide. If yes, provide the type and nomenclature of each prescribed form. the type and nomenclature for each new prescribed form. yes, provide the type of and nomenclature of each form being revised. publication collect SSNs. If yes, list the type and nomenclature of each new or revised prescribed form that collects SSNs. which a separate justification memorandum is attached. 23. SUBMISSION PACKAGE INCLUDES: Select all that apply. See AR 25-30/DA PAM 25-40 for submission requirements. for this publishing action, which is new, revised, rescinded, or for which proponency is being transferred. 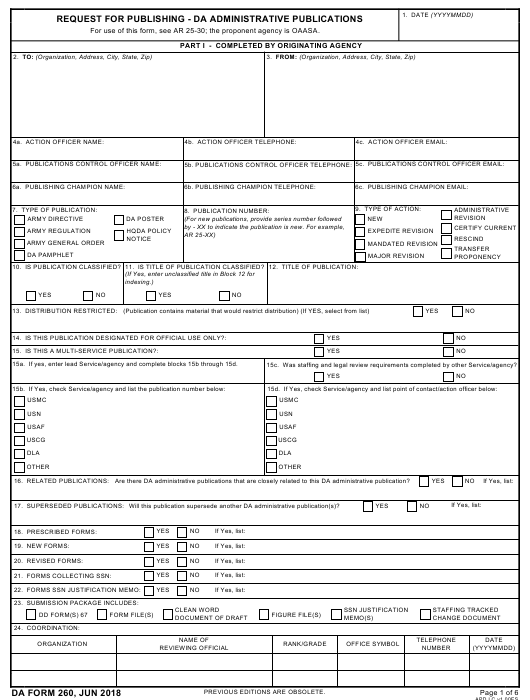 FORM FILE(S) - Any files that relate to the use of forms within the DA administrative publication being submitted for this publishing action. submitted but no comments or track changes. or revised prescribed form that collects SSNs. phase of the proposed DA administrative publication being submitted for this publishing action.